How can an innovative company do badly? I am a loyal and satisfied customer of Lego for the past seven years. After all, our son literally grew up playing with Lego bricks since he was four year old. Initial small kits for making cars slowly gave way to Hogwarts Express (from Harry Potter) and Dr. Ock’s house (from Spiderman-2). And today he makes and programs NXT robots and writes a blog My Legos: Guns & Robots. Naturally, with all these innovative products and the value they brought us, whenever I think of innovative companies, Lego’s name comes to mind. So, it came to me as a surprise to learn that Lego was going through its worst patch in its 87 year old history as I was buying more kits in 2003 (see Rebuilding Lego, Brick by Brick). I decided to find out, why? Brief history of Lego: Lego is a Danish firm founded by Ole Kirk Christiansen in 1916 (it got named Lego in 30s). Godtfred Kirk Christiansen (called Christiansen), the third of four sons, started working in father’s shop when he was 12. In 1947 father and son came across the building bricks from a British firm Kiddicraft. They bought the rights to the patent and started production in 1949. In 1951 Christiansen marketed the Lego bricks as a platform – something that becomes more valuable the more you buy. They were compatible with each other, letting children build elaborate constructions. A strategic decision: In 1960 Lego faced one of its biggest challenges when a fire wrecked Lego’s wooden toy warehouse, wiping the inventory. Building all those toys would be costly. At this point, Christiansen made a strategic decision. Bricks, which made up a minority of the company’s sales, was made the firm’s sole product. 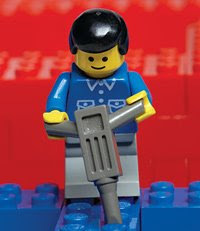 By the turn of the century, Lego became a national treasure and grew into one of the strongest brand in toy industry. Its colorful bricks are sold in 130 countries: everyone on earth has, on average, 52 of them. Trouble in Lego-land: After six years of slowing sales and falling profits, Lego’s crisis peaked in 2003, when it made a whopping DKr1.6 billion ($240m) operating loss on sales of DKr6.8 billion and was sitting on DKr6.8 billion debt. Rumors abounded that America’s Mattel, the biggest toymaker, would take over its long-coveted European rival. PE companies found a perfect prey: a mismanaged, medium-sized firm in the hands of a single owner. Christiansen family injected DKr800m of its own money and appointed Jorgen VIg Knudstorp as CEO. The “Kitchen” and supply chain woes: Knudstorp narrowed down the root-cause to three possible issues: (1) Over-diversification (2) unwieldy costs and (3) lost market window in video game market. They decided to scrutinize every aspect of operations closely: product development, sourcing, manufacturing and distribution. Soon they realized that recipes coming out from company’s “Kitchen”: product development lab, were increasingly intricate. A pirate kit includes eight pirates with 10 types of legs in different attire and positions. This reflected a culture of craftsmanship, but also its disregard for the costs of innovation. The company designers were dreaming up new toys without factoring in the price of materials or the costs of production. Lego group had 11,000 suppliers, nearly twice as many suppliers as Boeing uses to build its aircrafts. “We had a supply chain that was 10 to 15 years behind the times”, says Knudstorp. Looks like the supply chain transformation is working for Lego. In Aug 2008, it announced that its sales were up 20 percent and its pre-tax profits were more than doubled in 2008’s first half. This is how an innovative company learnt to manage its cost of innovation.